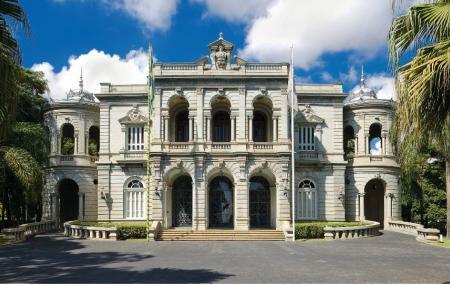 Built in 1897, this elegant neo-classical and art-Noveau palace was for many years the seat of the erstwhile Minas Gerais state, and as such, has been the site of many important historical events. In 2013, it was reopened as a museum. Visitors are greeted by gilded surfaces, parquet floors, crystal chandeliers, Latvian furniture, allegorical panels, exquisite sculptures, lavish décor, and the pretty garden. Of particular delight is the stairway that was brought all the way from Belgium. On the last Sunday of the months you can catch the beautiful ceremony of the Changing of the Guard (TrocaSolene da Guarda). Free guided tours on Sunday mornings. How popular is Palacio Da Liberdade? People normally club together Parque Das Mangabeiras and MM Gerdau - Museu Das Minas E Do Metal while planning their visit to Palacio Da Liberdade. The pride of the people of Belo Horizonte. Calm atmosphere with cool breeze blowing from trees and a satisfactory representation of nature right in the middle of a busy town. It's really good to bring your family here. And oh, I love the light here during Christmas. Beautiful palm alley. Got major redesign before 2019. It's more minimal now. Simple shapes, more open space. less flowers. Center for many public events still. This beautiful place is the best place to visit in BH when you enjoy a natural thing to look. Este é o melhor lugar para visitar em BH caso goste de observar a natureza. Amazing place!!! The architecture and the garden are fabulous! !